Stunningly beautiful, remarkably diverse, Montenegro astounds and delights at every turn. The frenzy of the beach culture abruptly gives way to an untamed interior where wolves and bears still roam the dark mountain forests which gave Montenegro (“Black Mountain”) its name. Only 625,000 people live in this nascent adventure destination, which holds some of the most rugged terrain in Europe. High mountains with limestone peaks, canyons, glacial lakes, plateaus and vast forests are packed into an area approximately 2/3 the size of Wales. But the wild -- and at times harsh – beauty of the landscape is in direct contrast to the warm Balkan hospitability of its inhabitants. Tourists are still something of a rarity in the north, and the horse-loving inhabitants always have a wave and a friendly word, often followed by an offer of a cup of coffee or homemade brandy (Rakija), for travelers on horseback. Craggy mountains plunge into the Adriatic Sea, striking karst formations tower above lush hidden valleys. Shepherds tend their flocks while sturdy ponies graze freely on the rocky hillsides. Old Royal Montenegro, (circa 16th – 19th centuries), with its millennium-old trade routes and strategic military location between warring empires, had a complex and fascinating history. The fiercely independent population of this nearly impregnable mountainous territory was divided into factious clans led by military chieftains, and united under a “Vladika” (Prince-Bishop). The Petrović clan of the Njegoš region held the post for many years; their mark left in nearly every village and hamlet we pass. One of the most influential, Petar II -- prince, bishop and warrior, but also philosopher and poet -- captured the political-historical struggles of the region, as well as documented the culture and traditions of the Montenegrin people in his 1846 epic poem, “The Mountain Wreath,” the theme of our journey. Hidden mountain lakes; rugged landscapes of striking stone formations; high plateau summer pastures with seemingly endless rolling hills; hidden ancient forest groves; valleys of roaring rivers where sheepdogs stand watch over their vulnerable charges: the north of Montenegro, a rugged and wild land, has yet to submit to the rule of man. Ride with us back into the past and through the land of the legends of the wolf. Here, intrepid shepherds live in the peaked mountain huts of their ancestors, draw water from ancient wells tucked between the limestone rocks, and in the shadows of the momentous mountain ranges slicing through the landscape, strike a balance with nature. 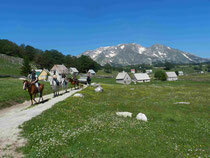 The 8-day horseback riding adventures are suitable for medium experienced riders, who are secure in all gaits. This trip is suitable for riders, who like to get in touch with local life in Montenegro and are ready for a small adventure.